Who is Borussia Dortmund's Christian Pulisic? Germany’s Bundesliga is home to some of the brightest young talents in world football, but perhaps none more so than Borussia Dortmund’s record-breaking attacker Christian Pulisic, who has taken the fast lane to stardom for both club and country. At just 19 years of age, Christian Pulisic is a regular for Bundesliga giants Borussia Dortmund and one of the hottest properties in Europe. He is a tricky winger capable of playing behind the striker or as part of the front three with impressive creative attributes. As reports of his uncertain future at Dortmund arise, Pulisic has emerged as a potential transfer target for Premier League teams such as Chelsea, Liverpool and Spurs, with numbers as high as £65m being thrown around in the media. Born in Hershey, Pennsylvania in 1998, Christian Pulisic is the child of two soccer playing parents. He started his youth career in England at Brackley Town but did most of his development in the U.S. at Michigan Rush and PA Classics before being scouted and signed by Borussia Dortmund at 16 years of age. 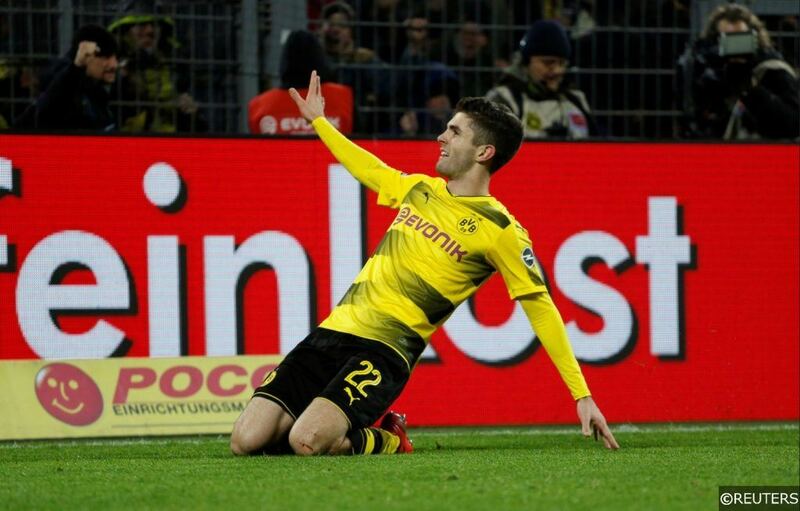 After scoring ten goals and assisting eight in just 15 games with the Dortmund youth team, Pulisic was called to join the first team over the winter break of the 2015/16 season. Pulisic made his Bundesliga debut in January 2016, coming on as a second-half substitute in a 2-0 win over FC Ingolstadt. He didn’t have to wait long for his first league start against Bayer Leverkusen in February. Being so young, he was naturally confined to a bit part role over his first few months at the senior level. He did, however, get his first Bundesliga goal not long after, scoring in a 3-0 win at home to Hamburg in April. With that goal, at just 17 years and 212 days old, he became the youngest non-German and fourth-youngest-ever player to score a goal in the Bundesliga. Shortly after that, he broke another record against Stuttgart, becoming the youngest-ever player to have scored twice in the German top flight. Pulisic made huge strides in the right direction in the 17/18 season, establishing himself as a first-team player at Dortmund in the absence of the injured Marco Reus. He was even rested by manager Peter Stöger midway through the season for having played too much. Naturally, Dortmund’s roller-coaster of a campaign caused Pulisic a few bumps along the way. He endured a ten-game goal drought in the second half of the season, but that didn’t stop him from winning TWO Bundesliga Goal of the Month awards! His numbers before turning 19 years old – 9 goals in 60 club matches and 7 goals in 18 international matches – also show promising signs when compared to stars like Cristiano Ronaldo and Lionel Messi at that age: Ronaldo had scored 6 goals in 53 club matches and 2 goals in 2 games for Portugal, while Messi had scored 9 goals in 34 matches at Barcelona – a better ratio than Pulisic domestically – but just 2 goals in 9 internationals for Argentina. Along with his club level achievements, Pulisic is thought of by many to be the top American footballing prospect. He is the youngest player to ever represent the US senior national team in a FIFA World Cup qualifier, the youngest player to score a brace for the USMNT, the youngest American to register a goal and assist in the UEFA Champions League, and the youngest American to lift a major European trophy. Some list. Records and Pulisic seem to go hand in hand. No 2018 World Cup appearance in Russia for Pulisic or the USMNT might have been a national disaster and a huge personal disappointment, but it has proven good news for Borussia Dortmund. Not only has their prodigal star been able to take part in their pre-season tour of the US – he even scored two goals against Jurgen Klopp’s Liverpool in the ICC – but he should also be raring to take the 18/19 domestic campaign by storm. Categories: Blog, Football, Transfer News, and Transfer Rumours. Tags: Borussia Dortmund, BVB, Christian Pulisic, Dortmund, and USMNT. Team Tag: Borussia Dortmund. League: German Bundesliga. Sports: Football.